I love, love, love, candy corn. So when Brach’s reached out asking if I’d like to bake something using candy corn, I immediately said yes! They sent me a HUGE box of a bunch of different flavors, but because I’m a purist, I baked with the Mini Candy Corn. Did you know they also make Fruit Crèmes, Peanut Butter, Caramel Macchiato, and Pumpkin Spice? So many choices! I decided to make cookies using a not terribly sweet sugar cookie base, and they turned out delicious. The candy corn melted and got gooey, and the cookies were amazing, especially while warm. 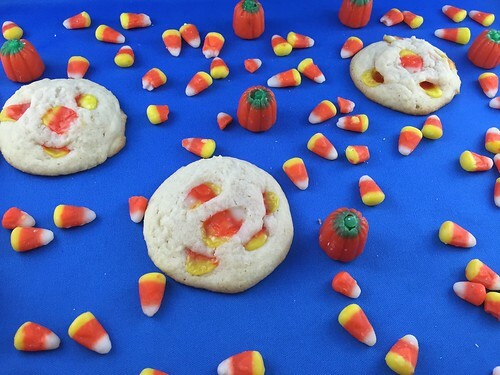 The thing to keep in mind with this recipe is to add the candy corn to the dough balls, making sure the candy is tucked into the dough and not touching the cookie sheet. Beat together the butter and sugar until light and fluffy, about 3 minutes with a stand mixer. Beat in the eggs and vanilla until very well combined. In a small bowl, combine the flour, baking powder, and salt. Gradually add the flour mixture to the butter mixture and mix until combined and the dough comes together. Use a cookie scoop to drop balls of dough on the prepared baking sheet, about 1-inch apart. Tuck candy corn into dough, making sure the candy does not touch the cookie sheet. Bake for 8 minutes or until edges are golden and tops are just slightly underdone looking. Cool for 10 minutes on the cookie sheet before transferring to a cooling rack to cool completely. 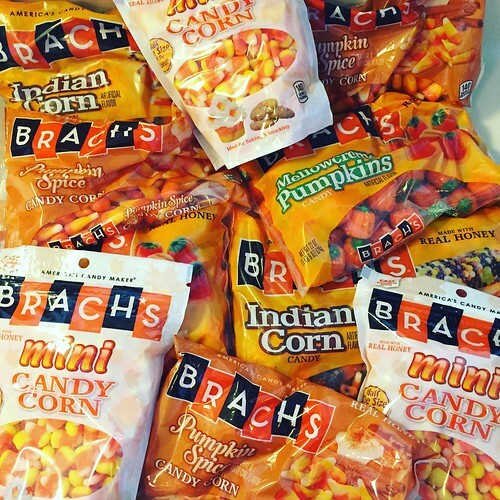 Disclosure: I received a huge box of candy corn from Brach’s because they are awesome!